For STEM Friday we are featuring a new children's picture book, About Marine Mammals: A Guide for Children by Cathryn Sill and illustrated by John Sill. The Sills are a talented couple who have been collaborating on books in the award-winning About... series and the About Habitats series. If you have seen their work before, you know what to expect. John Sill's gorgeous watercolor illustrations catch the readers' eyes. Then they turn to Cathryn Sill's clear, uncomplicated language. In remarkably few words she explains the scene and draws readers into it. The "Afterward" in the back matter contains more detailed information about each of the previous scenes with a paragraph about each next to thumbnails of the illustrations. For example, did you know polar bears can be considered to be marine mammals? They swim between blocks of floating ice looking for other marine mammals such as seals. Planning a trip to the beach? About Marine Mammals would be a perfect book to get children inspired about ocean creatures before the trip, learn more about what they see during the trip, and reinforce memories and learning after the trip. Not traveling? It would also be a wonderful way to take a trip to distant, cool places in your imagination. Earlier post about humpback whales with 3 suggested science activities. 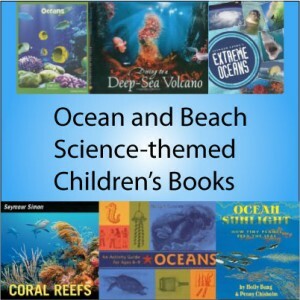 See our growing list of ocean and beach science-themed children's books at our sister blog, Science Books for Kids.